ALTA OIL & PROPANE CO., INC. Welcome to Alta Oil & Propane ! 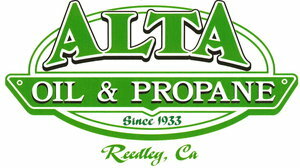 Alta Oil & Propane is located in Reedley, Ca. We are a locally owned and operated family business. We have been providing excellent service to our customers since 1933! Whether you need propane delivered or a storage tank and pipeline installed we offer our professional knowledge and experience to meet both your residential & business needs! We are a full service propane company. Ready to provide you with exceptional service!